Been to a meeting? Then you are sure to find managers asserting their views on topics of their interests to get the necessary budget for them. You can even see some heads looking at others not expressing their views. While you are sure to find a few who always opinionate or not allow others or say dominate the whole. This is a normal scene in a meeting room. Of the types of personality, the most hated would be the aggressive personality. There is too often a confusion between being aggressive and being assertive at work. The former type of person does not pay heed to opinions and views of others, dominating them using extreme means of criticism and humiliation. The latter personality is able to express their views and of others, opinions, beliefs, emotions in an appropriate manner. 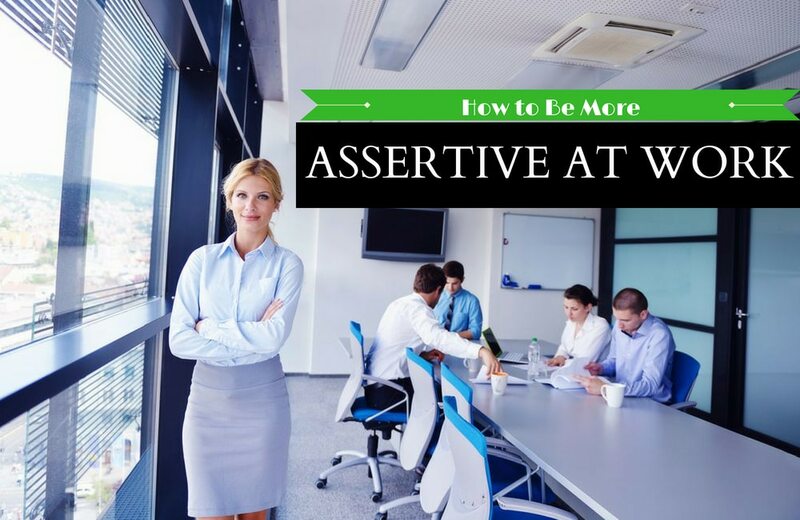 How to Become Assertive at Work? You may feel that by speaking up or voicing your opinion means not giving due respect for others. In due course you would be submerging your ideas pushing it down your throat. By conversing in kind tone, you could express your thoughts and value others opinion as well. This is exactly what it is to be assertive! This process may not seem difficult if you are aware of your strengths and weaknesses. You have to be truthful in evaluating about how you contribute to the work and where do you falter. By taking note of your qualities, you are sure to understand where you need to make improvements. Taking inventory would help in knowing what sort of person you actually are at the work place and find ways to amend yourself. On the other hand, you may even find that you are an assertive person after all!! You may notice that you have many sort of notices all around your workplace. What are they intended for after all ? Its to educate you and make you aware of your rights. For those who are made to work beyond time or through lunch breaks or being mistreated, it is necessary for one to be aware about your surroundings. Your knowledge helps you to empower yourself and seek the needful. Have you been missing out on your family’s get together to take care of an important project assignment? Or do you get tempted to answer those mails waiting for your response even after your working hours? Then it’s time to think about your limitations to that project or your workplace. Keep abreast of boundary to your work to avoid stress and frustrations at home. You need to say ‘No, sorry, I can’t do this” but you are too confused how to say it right on the face. Then it’s better to rehearse in front of your partner or your sibling before making a blunder of your image by playing the role. Be clear of what you want to say, why you want to and how would you like to say it. As you are intending on making change to your style, taking small steps is advisable. Think about the activities that you are normally involved with and rehearse yourself to be assertive in certain instances. That may involve your family, relative or your friend. Learning to merge some qualities to your skills? Do take time as it requires yourself to be patient. Sometimes, you may find that you haven’t answered appropriately or might have created new enemies due to miscommunication. Don’t worry that you have faltered, the learning curve is not always straight. Give yourself time and practice with patience keeping in mind what you intend to do. It is better to keep your words simple and to the point. This would help you to make others understand what you intend to assert. Expressing views and thoughts need to be executed properly by using the right words that is clear to understand. Avoid using jargon and ‘you’. If you replace it with “I” you consider yourself along with them and make them feel that you are along with them as well. Your body posture would indicate if you are confident or not. Making yourself assertive requires you to maintain proper upright posture and keeping eye contact. Try avoiding changing your facial expressions and crossing your arms or legs while communicating. Most of the time resolving conflicts would get your emotions to be involved as well. In that case, try to avoid getting angry or cry over an event. As it is normal for emotions to emerge during a situation, keep yourself calm and avoid conversation. Once you have eased out, you could talk out with clarity. What are the Benefits of being Assertive at Work? As said earlier, being able to express your thoughts or views openly is the main quality of being assertive. It is considered as most important communication skill as it indicates their belief to show respect for others and is considered as the most reliable person who would stand up for their and others belief’s. You are sure to note that by being assertive in your remarks, your self-confidence enhances and brings a sense of pride to your morale. The best part is that by being assertive, you are respected by one and all for this quality that you would maintain. This quality allows you to say ‘No’ in an affirmative manner without hurting anyone and in turn does not allow stress to come to your life. Its another way of handling a situation diplomatically in an effective way. Being assertive allows you to clarify the views of yourself and others as well. Imagine a tussle in your workplace and having to deal with different types of people. By employing appropriate language and words, it is possible to resolve even the toughest conflicts! By having right communication in the right way earns respect from everyone around you as you would be known for delivering message successfully. Having this added quality helps you to make the right decision that is needed for the hour. It avoids from taking too much work load and create stress for yourself. Without arguing much and avoiding friction within team, it is possible to maintain good relations with everyone. By being assertive, you would be able to manage your chores with satisfaction as you are able to spend time with your loved ones as well. By refusing to take on add-on’s, you would avoid getting stressed out. -The most common technique to improve assertiveness is to be like a wall onto which anything thrown does not allow to pass through. In this case, by resorting to calm way of allowing the other person to speak their views but not resorting to being aggressive brings in the effect that you desired. Having said that, this methodology can be employed if people around you are manipulating or being aggressive towards you. – The next common method is to assert your point repeatedly without raising your voice or changing your tone. By not getting irritated or angry, you would be able to express your point with clarity and to the point. This way it is possible to avoid irrelevant arguments that could arise due to miscommunication. – If you find that you have shown improvement in your attitude then it’s time to treat yourself. Give yourself a break and reward yourself. It could be silent moment with your partner or by yourself. Try taking a break and you are sure to see that you have improved a lot. How Does Assertiveness Help in a Workplace? 1. Having this quality allows you to be more self-confident and face a drastic situation whenever it arises. 2. This attitude allows you to speak about your views, opinions and belief’s without hesitation directly. 3. It also helps you to understand the person’s feelings and what he/she intends to communicate. 4. You may find that being assertive brings in more friends than foes. 6. Your communication skill gets enhanced that helps you to pass on message clearly. 7. Keeping this quality allows you to say what you want, how you want and what you see in a proper manner. 8. It boosts your self-morale and earn self-respect raising your level of confidence. 10. It helps you to take up the work of leadership role that handles situation diplomatically. It is an opportunity for career enhancement. How To Make yourself Assertive? In the first hand, get to know what the person needs without hurting or upsetting them. By expressing your point of view, you could put forward your thoughts or opinions and consider the other persons views as well. By bringing out the intended views, you could show the difference between the agreed and actuals. By expressing the behavior of others, you could show how it hurt you due to their misbehavior. You could show affirmative remarks to indicate to the other person about their behavior and instigate to make changes. It is better to avoid being aggressive or get angry at remarks or comments. Show honesty while expressing or exchanging information. It brings in more relations. This is one of the most important characteristic quality that would help you to be recognized among the crowd. Have any issues with anyone, then it’s better to talk directly to the concerned rather than with others that would spoil you relations. Previous articleHow to Become an Employer of Choice? Next articleWhat To Do At Work When There Is No Work?